These blueberry scones with lemon glaze are the perfect pairing for your morning coffee. Good luck eating just one! A warm buttery scone bursting with fresh blueberries is a great way to start the day. The lemon glaze adds a sweet tartness that is a perfect balance. Whether you like scones or not the smell of these baking will make your mouth water. These delicious scones are easy to make and will keep you coming back for more. If you love these lemon blueberry scones, you’ll also love these Pull-Apart Cinnamon Rolls! Have I mentioned how much I love the combination of blueberry and lemon? If you love that tart and sweet, this is the recipe for you. Perfect for breakfast or as an afternoon snack, you’ll love how rich and delicious these blueberry lemon scones truly are. If you love these easy blueberry scones, you’ll love these Monkey Bread Waffles! Important: Dice and freeze your butter at least 1 hr before starting, I left mine overnight so it was ready to go when I started. 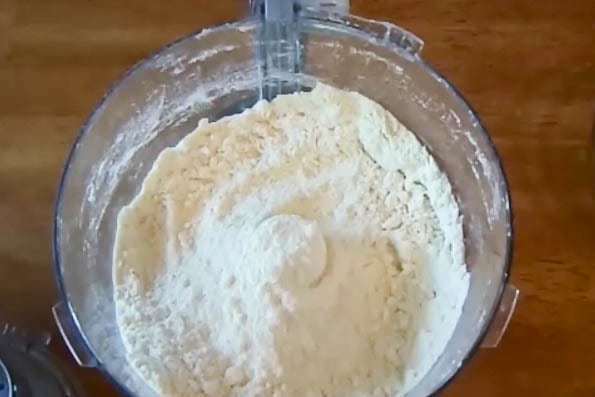 Combine all your dry ingredients, flour, salt, baking powder, and sugar in your food processor. Pulse a few time to combine well. Add in your frozen butter and pulse until you have a breadcrumb texture. Transfer over flour mixture to large bowl and add wet ingredients eggs, yogurts, and vanilla. Fold mixture until just incorporated. Do not over mix! This will create a denser scone. (We want those frozen butter crumbles intact when it goes into the oven to createlittle-meltedd pockets in our scones.) Very gently fold in the blueberries. Flour up your hands and place dough on a well-floured surface. Pat down into a rectangle shape 1” thick. Cut into triangles or desired shape. Place scones on greased baking sheet spaced about apart. These will grow. Bake in 375 degree oven for 25 min or until brown. You can check your scones with the toothpick test. Prepare your glaze while these are baking or cooling. In a bowl sift in your confectioners sugar and mix in butter. Pour in lemon juice, zest and mix well. Glaze your scones once cooled a little and sprinkle with raw sugar which adds a nice crunch. Serve warm and enjoy! Q: Can you make these scones with any fruit? A: Absolutely. You can substitute the blueberries for any fruit you’d like. 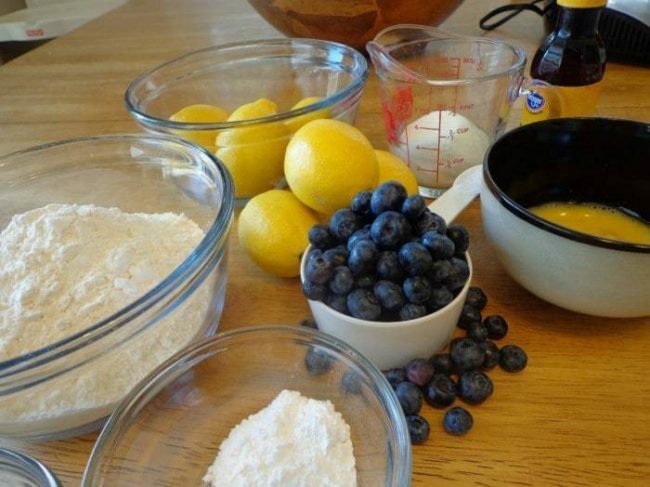 Q: Can you use frozen blueberries in this easy blueberry scone recipe? A: Using frozen blueberries is possible, but it may make your scones runny due to the excess liquid. Q: How do these blueberry scones taste without the lemon glaze? A: Amazing! If you don’t want to add the glaze, you don’t have to! IF YOU LOVE THESE BLUEBERRY SCONES WITH LEMON GLAZE, SPEND A FEW MINUTES TO SEE THESE OTHER BREAKFAST RECIPES THAT WILL BE AN AMAZING PART OF YOUR RECIPE COLLECTION! A delicious breakfast or brunch recipe, you'll love these blueberry scones with a fresh lemon glaze topping. Transfer over flour mixture to large bowl and add wet ingredients eggs, yogurts, and vanilla. Fold mixture until just incorporated. Do not over mix! This will create a denser scone. (We want those frozen butter crumbles intact when it goes into the oven to create little melted pockets in our scones.) Very gently fold in the blueberries. 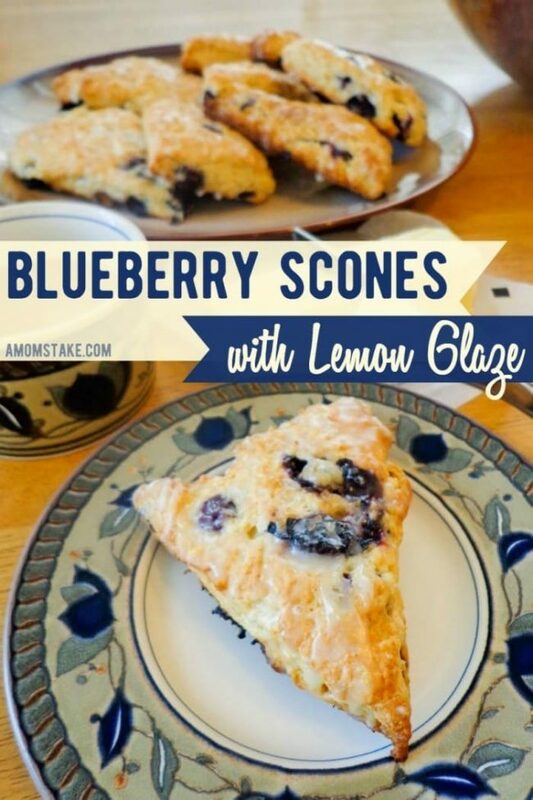 What will you serve with these yummy blueberry scones with lemon glaze? these look delightful. I may just go in and whip some up for brunch, right now! I love scones and have not made them in quite awhile. Need to make these again. 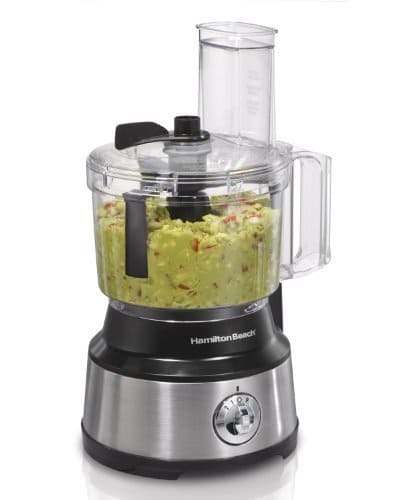 I don’t have a food processor, can i just cut in the butter til crumbly, then add the wet ingredients? Yup, the butter won’t get as small but it will work okay! It’s just a bit hard to cut butter small when it’s frozen. I absolutely love scones! And the blueberry and lemon combo is to die for! Yum! 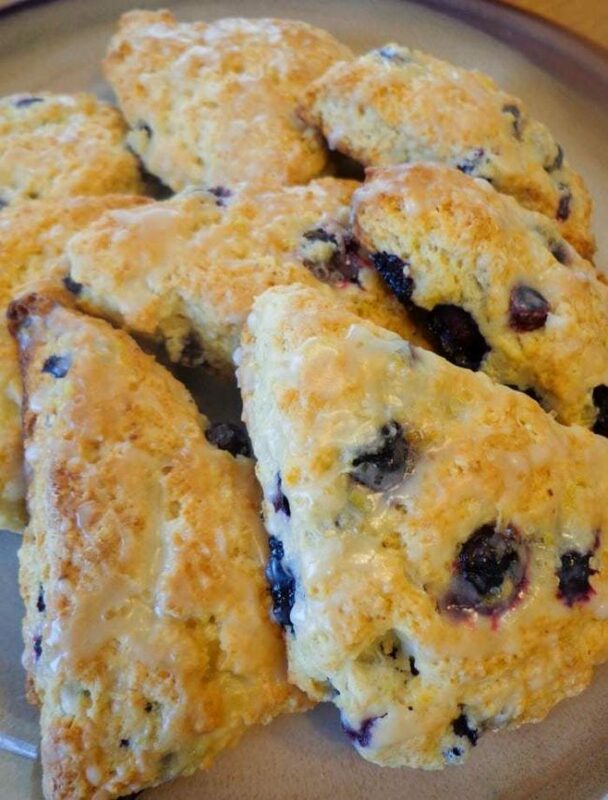 My husband loves blueberries and would love these scones. They look delicious and easy to make. What an awesome recipe for when the ladies come to visit and have with coffee or tea. These scones seem so easy to make. I would eat them with a glass of iced tea. It’s like you picked two of my families favorite flavors and combined them! Blueberry for my husband and lemon for me! WIN-WIN! These look delicious and sound like a recipe I could handle! 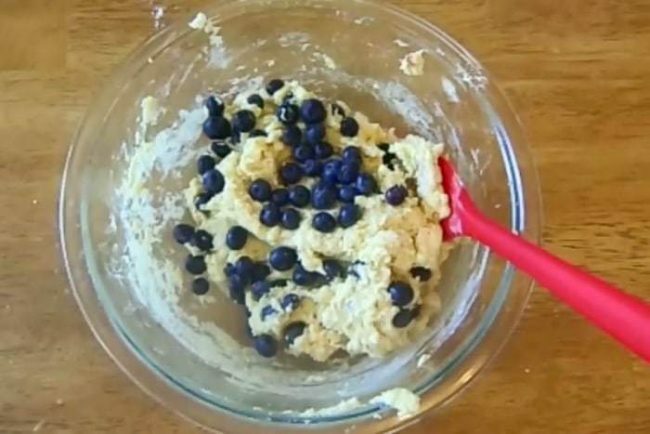 Your blueberry scones look so delicious! I love eating scones with my morning coffee or tea. Oh yum! That does look really good! That looks heavenly. I love the combination of lemon and blueberry! These look delicious! There is absolutely nothing like the flavors of blueberry and lemon together. These look so good and I want to make this recipe for breakfast and the kids will love it. I am going to make it for back to school for breakfast! These look delicious, and the lemon glaze would add a bit of tartness. I like how easy these look to prepare too! 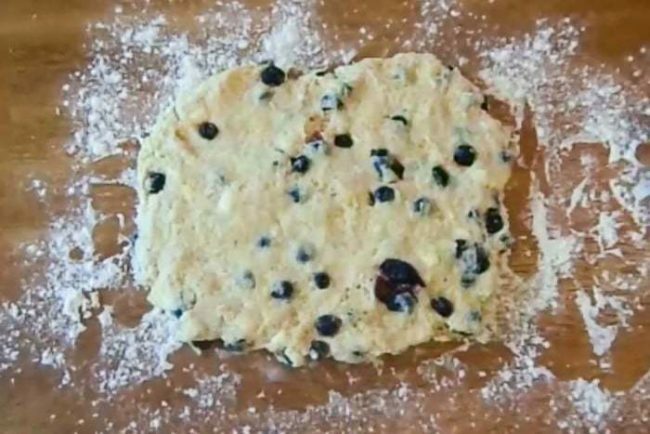 These blueberry scones look really good. I have never had a scone before, would love to try these. Those look and sound delicious! Thanks for the recipe.